Change up your ordinary Potato Salad – grill the potatoes, add bacon and a light dressing, and you have one out-of-this-world Bacon Potato Salad! With grilling season upon us, we often think about cooking burgers, hot dogs, or sometimes even brats on the grill. But how about potatoes? During the heat of the Summer, coming up with a side dish recipe that won’t heat up your kitchen is often important, how about adding the side dish to the grill? Whether you are hosting a cookout, cooking dinner for the family or maybe camping, adding the potatoes to the grill is super easy. And the added flavor from the grill is another bonus. I don’t know about you, but one of the first dishes that come to mind when I think of Summer is potato salad. 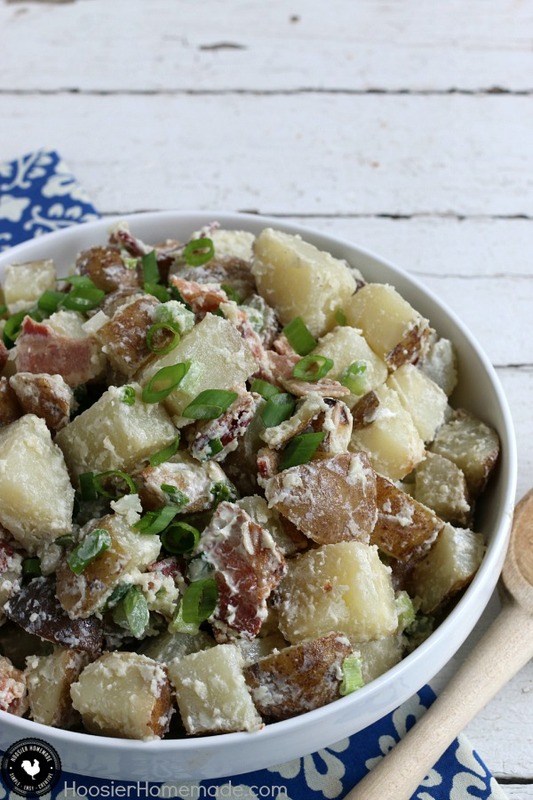 This Bacon Potato Salad is super easy to make, and full of flavor. One of my goals for this year has been to eat better and get physical. I have switched my morning routine, started doing yoga, and am choosing better-for-me foods. I’ve also been incorporating corn oil into more of my cooking. Did you know that corn oil has more cholesterol-blocking plant sterols than other cooking oils, almost 4X more than olive oil? A recent study published in the Journal of Clinical Lipidology found that corn oil helps lower cholesterol more than extra virgin olive oil. Plus, corn oil has a high smoke point, making it a great all-purpose cooking oil you can use for everything from grilling to sautéing, and even baking! Mazola Corn Oil® also has a neutral flavor, so it brings out the flavors of the other ingredients. 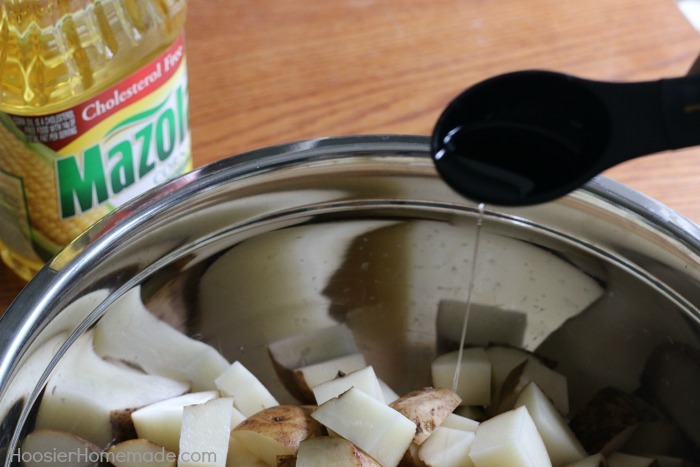 To get the potatoes ready for the grill, wash and cut them into chunks and add them to a large bowl. Then add a drizzle of Mazola Corn Oil, and a sprinkle of salt and pepper. Toss the potatoes to coat them, then spoon them onto pieces of foil. You can also use a metal pan, but foil works just fine. Close up the packet and place on the grill to cook. While the potatoes are cooking, it’s time to prep the rest of the ingredients for the potato salad. First comes the bacon. We like to cook our bacon in the oven, but since you have the grill going, it’s easy to cook the bacon on the grill as well. You can use a griddle pan or even a foil pan to cook the bacon. You could also use leftover bacon. Perhaps cook a little extra at breakfast time and save it for the potato salad. Then, for a little extra flavor, you will need 1/4 cup each of celery and green onions. The dressing is easy to make and can be mixed ahead of time – just a couple tablespoons of light mayonnaise and light sour cream whisked together. After the potatoes and bacon are cooked and cooled slightly, toss together all the ingredients, and you have a spectacular Potato Salad that will quickly become your family favorite. To find out more about the benefits of cooking with corn oil, visit Mazola.com. Change up your ordinary potato salad by grilling the potatoes, adding bacon and a light dressing for one out of the world Potato Salad Recipe! mmm…mmm…loving this potato salad so much, bacon is amazing in potato salad. What a fun recipe! 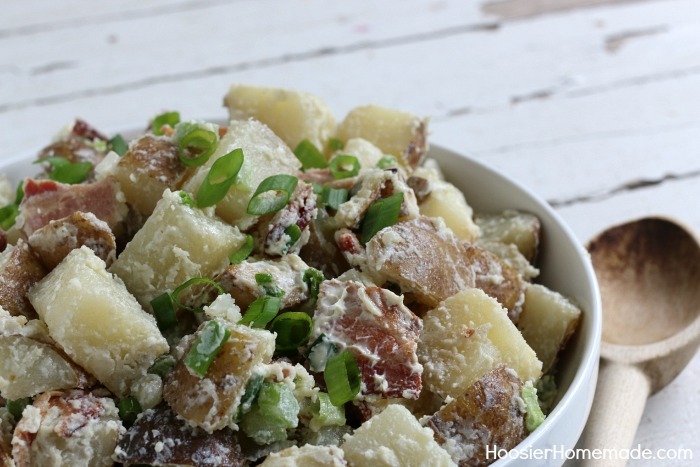 The perfect potato salad for summer parties…bacon is a delicious addition! Thanks so much Alida! I’m really looking forward to Summer parties this year. Thanks so much Jen! I agree, every potato salad should have bacon. At every summer potluck I go to, it seems that the potato salad is polished off quickly. With the addition of bacon – I’m sure it would be gone in an instant! Great idea! Thanks so much Michelle! So glad you like the potato salad!